Photo - Septal haematoma, showing the left sided component. You would expect to find the same appearance on the right and palpation reveals a fluctuant/soft mass. Do not miss septal haematomas - if left untreated, they can lead to septal abscess and ascending cavernous sinus infection, and/or necrosis of the septal cartilage and saddle deformity and/or septal perforation. IMPORTANT: Some of these patients may have other associated injuries, e.g. intracranial haematoma / base of skull fractures, which should be investigated by A&E and referred to the neurosurgical/trauma/maxillofacial teams before involving ENT in the care of the nasal fracture. When there is a septal haematoma, as this usually requires prompt incision and drainage under general anaesthesia. When there is heavy traumatic epistaxis. Under ENT: Patients who have a septal haematoma or traumatic severe epistaxis, with no other major injury. Joint care with neurosurgeons/trauma team: Patients who have other major injuries but who may also have a septal haematoma or severe traumatic epistaxis. Patients with an isolated nasal fracture and no septal haematoma or epistaxis do not require admission under ENT. Is there a serious head injury, other facial fractures or need for a CT head? Have you cleaned and closed any wounds? Is there a septal haematoma? After epistaxis has subsided, is there continuous clear and watery (rather than mucus) rhinorrhoea? Patients with isolated nasal injuries can be managed as outpatients as the nose is too swollen immediately after trauma. It can only be effectively assessed five to seven days later, once the swelling has subsided. Patients discharged from A&E with nasal trauma should be booked into the ENT emergency clinic seven to ten days afterwards for manipulation and further treatment. NB - Plain radiographs of the nose are not useful in the assessment of isolated nasal bone fractures and should not be done. This is not the case for mid-face fractures. 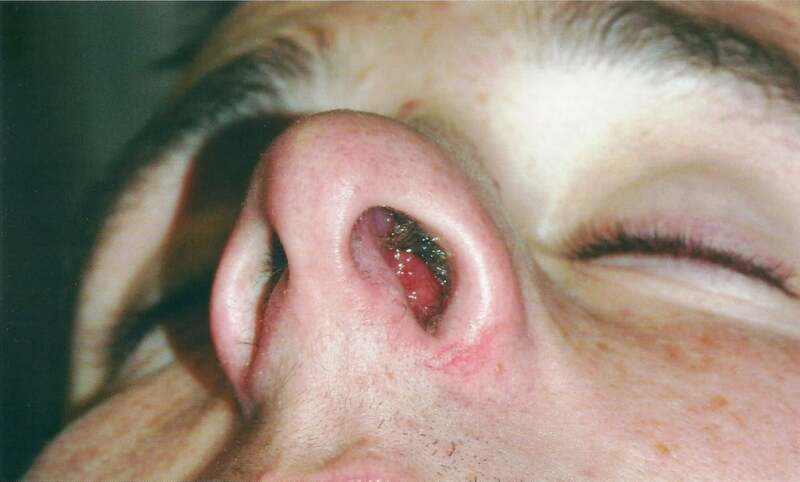 You may be asked to rule out a septal haematoma, which is blood collecting under the lining of the septal cartilage causing a red/purple, fluctuant swelling on both sides of the nasal septum. This can be confused with a deviated nasal septum, so check the other side for a concavity which would imply it is just deviated cartilage. Palpating with a Jobson Horne probe can help to establish if there is fluctuance. Presence of a haematoma can also be confirmed by aspirating blood and clot with a green needle. Patients sometimes attend a few days after head trauma complaining of continuous clear and watery nasal discharge (usually unilateral if due to a CSF leak. If you can see evidence of this, send a sample (a few millilitres) to the lab for beta-2 transferrin/tau protein, to determine whether it is CSF or not. You can give a small plastic sterile container to the patient to catch the discharge at home if none is forthcoming in clinic. Ensure patients have analgesia. Patients who need to be packed should be observed for around 24 hours before removing packs (see epistaxis). A septal haematoma will have to be drained as soon as practical, which will require senior input. A possible CSF leak can initially be managed conservatively if there are no symptoms of meningism and no neurological signs. Standard neurosurgical practice is not to give antibiotic prophylaxis as there is no evidence of benefit. CSF leaks are unlikely in isolated nasal injuries with no loss of consciousness. Most will heal spontaneously and only a few require a rhinological/skull base opinion for endoscopic repair. Patients can be assessed in ENT emergency clinic five to seven days after injury to determine if they are suitable for a manipulation under anaesthesia. This allows enough time for the swelling to decrease and allow assessment of any deviation, but leaves enough time to arrange an MUA before the fracture heals. It is important to ask the patient about the appearance of the nose in the right way - we suggest: "Do you think your nose has changed in appearance since your injury? ", or "Do you think your nose is deviated to one side following the injury?". Remember that the patient may have had previous nasal injuries, and may have had a deviated nose prior to the most recent injury -- in which case MUA is unlikely be of benefit. There is no other indication for MUA other than a new lateral deviation of the nasal dorsum. Any dorsal hump that the patient points out would not be likely to have resulted from an injury, and would not respond to MUA. Traumatic septal deviations are not usually dealt with in the acute setting, but are generally allowed to heal for >6 months before considering septoplasty if the nasal airway remains a problem. MUA is usually performed under general anaesthesia but can also be performed under local. Manipulation should ideally take place within 14 days after the injury and certainly within 21 days. The patient should be informed that the deformity may not be corrected completely. Any residual deformity even after manipulation may require more surgery 12 months or more after the injury (eg septorhinoplasty; only funded by the NHS in certain cases).